The Kurds of northern Syria, together with the Kurds of Turkey and Iraq, have been at war with ISIS since the latter rose up and declared their so-called caliphate. It was the Syrian Kurds and their Kurdish comrades in Turkey who helped rescue the Yezidis, after they had fled the ISIS onslaught to take refuge in the Sinjar mountains. It was the Syrian Kurds and their comrades in Turkey who liberated the city of Kobani from ISIS. But the Kurds of northern Syria have not just been waging war. They have also been waging peace: creating new, democratic structures, declaring autonmous cantons; setting up schools, universities, hospitals. They have taken their inspiration from the Zapatistas of Mexico, who in their thousands retreated into the jungles of Chiapas and together with the Mayans created a new society, free from the oppression of the Mexican authorities. In short, the northern Syrian Kurds have created and are living a social revolution. 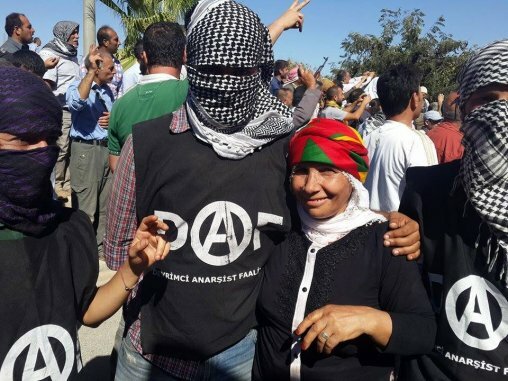 It is no wonder, therefore, that the authoritarian and neo-Islamist Erdogan Government of Turkey is doing everything it can to break the Kurds, including providing covert support to the Kurds’ main enemy, to ISIS. This entry was posted in War and tagged Iraq, ISIS, Kurdistan, Kurds, Syria, Turkey, Yezidis, YPG, YPJ. Bookmark the permalink.